Artists and theologist of Ancient Egypt worked together in the emergence of iconographies and they combined different planes of meaning: images and words. That is why reading the Egyptian art requires an iconographic and textual analysis. The Egyptian art: a language of signs. The Egyptian art is a language of signs and just like the Egyptian language, it uses word games; that is decoration often plays games of images. Where do we find the game of words? Irt is also the infinitive of the verb ir, which actually functions as a noun and describes the action of doing and / or creating. In addition, what does the eye have to do here? In Egyptian mythology the eye of Re is the creative eye, which with its tears (rmyt) creates men (rmT). The eye (irt) is responsible for creation (irt). The same word with the same phonetics identifies different words linked together by a myth and capable of creating word games. Word games in Egpytian art. In the same way, figurative language also presents these “word games” through scenes that contain symbols or double meanings. For example, a very common scene in Egyptian art is to smell a lotus flower bud. This funerary iconography not only represents the gesture of inhaling the perfume of the flower, but there is a transcendent encoded information. The lotus is a plant that closes at night and gets into the water; it goes out and open again in daylight. Therefore, ancient Egyptians linked this flower to the idea of regeneration; for that reason, lotus was included in the Egyptian art and in funeral offerings. In addition, in Egyptian language the verb “to smell” (ssn) also means “to breathe“, one of the vital faculties that the deceased needs to resuscitate. On the other hand, the lotus fragrance also helped the regeneration of the dead. The deceased must recover the vital breath and the first breath of air he receives is one of the first steps to achieve rebirth. In the funerary iconography, this is reflected through the standardized scene of smelling the lotus flower, because the one, who perceives the aromas, breathes. It is a gesture directly linked to the concept of regeneration and propitiatory of the resurrection of the deceased. The iconography as a whole. In Egyptian art parietal representations are groups of scenes articulated in registers, within an architectural space and with scarce narrative intention. The set of images works by correspondences, they do not count something, but they mean something. The image of Hapy (personification of the Nile) with a loaded tray of gifts. Two different iconographies, but both with distinguishable components (a tree, an anthropomorphic character, food tray …) and with the same iconology, indicating the same abstract concept. With existing elements, the Egyptian artist could depict perceptible and not perceivable realities. For instance, he used the image of a balance for the figuration of a goldsmith’s workshop, but it was also a motive used in the scene of psychostasia (weighing of souls). Thus, the balance expressed also the idea of final judgment and justice. Therefore, that image, although always accompanied by a text, had a message in itself. The balance depicting the goldsmith and the psychostasia in Egyptian Art. All the above shows the collective and functional character of Egyptian art. It had a practical purpose and a masked information, which we can be interpret. The Egyptian artist reproduced a reality, but also represented a truth behind a recognizable façade. The text that accompanies it. Each element of the composition and its symbolism. 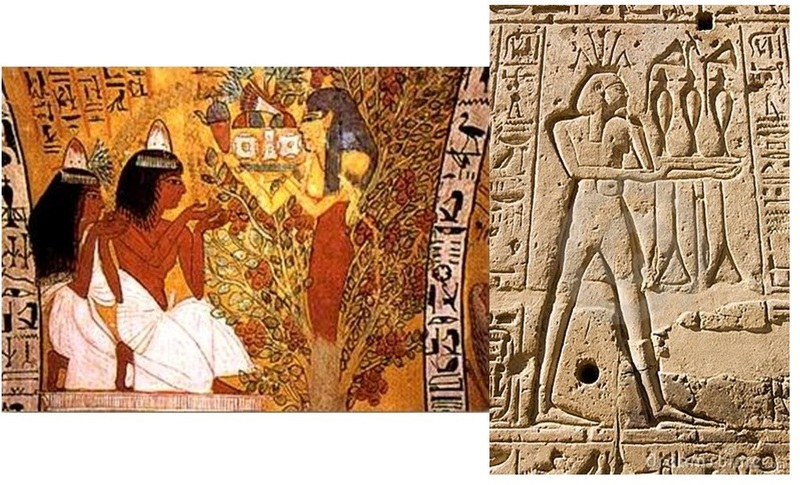 Posted in Blog "Hair and Death in Ancient Egypt"
Uniformity in Egyptian Art. An Aproximation.